Urgent appeals have been posted online in Qinghai about lead poisoning in the local water-supply due to named mining and smelting operations, following up from a report in the Chinese state media in 2006 confirming that excessive levels of lead in the area had resulted in "panic" among parents. The appeals state that the matter was not dealt with – at least partially due to corruption – and persists today, bringing "bitterness and disaster" for local people. There has been a pattern of mass lead poisoning across China in the past two years, with local people who attempt to raise concern being silenced by the authorities. Tibet is now one of the biggest lead-smelting regions in the PRC, so the problems are likely to be far more widespread than is currently known. A blogger in Tibet whose real name is not known has written in detail about the impact of lead poisoning of the water-supply due to pollution from the Ganhetan Industrial District in Huangzhong (Tibetan: Rushar) county in Qinghai province (the Tibetan area of Amdo). The blogger referred to more than 100 children falling ill in 2006 due to the lead poisoning, and in a separate blog, results of tests showing that almost 1000 children and youths had excessive levels of lead in their blood. The same source reports that not only have the authorities failed to deal with the mining enterprises producing the pollution, but they have also recently moved local farmers off their land in order to expand the Ganhetan Industrial District. The same blogger posts a petition which he or she states is from all monks and laypeople in and around Kumbum (Chinese: Ta’ersi) monastery, one of the largest and most important monasteries in Tibet, in Rushar to State Council, Provincial, Municipal and County-level Leaders, dated June 30, 2011. Part of the petition, translated from Chinese, is as follows: "High-polluting and wanton extractive business practices have brought bitterness and disaster for the local people. Local villagers have obstructed the mining on many occasions, demanding that the sacred mountain [known as Lhamo mountain] not be mined and requesting Kumbum Monastery to act as an official protector. The monastery management committee submitted a report on the situation to the higher authorities, but there was no response. As of this year, the situation has become more serious, especially during the months of May to July, when eight villages had serious contamination in their water pipes with the water becoming muddy and foul smelling. Monks and local people became nauseous, their bodies became listless and they felt dazed and some even had to be hospitalised from drinking the water. The risks of publishing such a petition are high as there has been a pattern of silencing local people who raise concerns about issues such as mining and pollution. In an incident last August, Chinese police shot dead a Tibetan during a peaceful protest related to mining in a Tibetan area of Sichuan (ICT Report). The original Xinhuanet report, published on March 27, 2006, named four lead smelting enterprises in the Ganhetan Industrial District as being responsible for the pollution – the Western Mining Co Ltd Branch Co Ka’erduo Smelting Works, Western Regions Lead Smelting Ganhe Smelting Works, and the Western Regions Lead Industries Ganhetan Crude Lead Factory – and added that new enterprises were being built. The 2006 report, which appears in Chinese but not in English online, states: "The culprits causing excessive lead levels in the students’ blood are the several lead smelting enterprises concentrated in the area. Villagers told this journalist that almost 200 children from the village had been to the hospital for examinations, and the results showed that they all had excessive levels of lead in their blood – the highest was 502 micrograms per liter." Lead is toxic to many organs and tissues including the heart, bones, intestines, kidneys, and reproductive and nervous systems. It interferes with the development of the nervous system and is therefore particularly toxic to children, causing potentially permanent learning and behavioral disorders. Symptoms include abdominal pain, headache, anemia, irritability, and in severe cases seizures, coma, and death. No safe threshold for lead exposure has been discovered, and there is no known amount of lead that is too small to cause the body harm. A video uploaded to a Chinese video sharing site 56.com shows turbid and discolored water being pumped out of a spigot by a monk at Kumbum monastery, birthplace of the religious teacher Tsongkhapa, and one of the six great Gelugpa (Yellow Hat) monasteries. Close to Qinghai’s capital city of Xining, Kumbum is an increasingly popular destination for Chinese pilgrims and tourists. In a posting dated July 17, the anonymous blogger said that the Xining authorities had organized relevant departments to test 919 children around the Ganhetan Industrial District, and the results showed that "almost 1000 children and youths had excessive levels of lead in their blood". The same blog reports that a journalist came to area and investigated several villages for lead poisoning. As far as can be established, this research has not been published in the state media. On July 23, the blogger wrote: "In recent years the environment at Kumbum Monastery has become awful. The local government and businesses have colluded to build a great many polluting enterprises five kilometers from Kumbum Monastery, and so every time the wind blows or it rains, smoke, dust and foul-smelling air settles down on the roofs and courtyards, and the temples’ golden tiles and wall murals are already corroding." The lead-poisoning is a long-standing issue, and local people say that entrenched corruption has prevented the matter being resolved, and means that students and others have no alternative but to move away from the area. An anonymous villager posted the following message in Chinese on the Huangzhong County government website, dated May 19, 2010: "I'm a villager from Podong Village in Ganhetan Town, and for the past several weeks we've been unable to drink the running water; and we've heard that the water contains the chemical composition of lead. It is hoped that the County Chairman and relevant County Government officials can run a few tests and give we the villagers in Ganhetan Town a rational explanation!" The anonymous blogger who posted the appeal from Kumbum also wrote in a separate blog that more than 30,000 farmers had been moved off their land in the area, in order to facilitate the expansion of Ganhetan Industrial District, and in their place more enterprises are to be built that had been moved from the Chinese interior because of serious pollution. Many monks from Kumbum have also been affected, as their families’ land has been taken. The blogger concludes that the authorities should be concerned, because: "Kumbum Monastery is not only the birthplace of Tsongkhapa, it is also a state-level culturally protected work unit as well as a scenic tourist area well known domestically and abroad." The same issues are likely to be widespread across Tibetan areas. There is a new smelter producing 100,000 tons of lead a year at Golmud (Chinese: Ge’ermu) in Qinghai, and West Mining and Yugang Gold are due to start a 100,000-tons per year lead joint venture, according to Metal Bulletin News Alert Service (August 3, 2009). The latter 270 million yuan ($40 million) project will also be capable of producing sulphuric acid, a by-product. In an investigation published on June 15, the New York Times reported that: "In the past two and a half years, thousands of workers, villagers and children in at least 9 of mainland China's 31 province-level regions have been found to be suffering from toxic levels of lead exposure, mostly caused by pollution from battery factories and metal smelters. The cases underscore a pattern of government neglect seen in industry after industry as China strives for headlong growth with only embryonic safeguards." A Human Rights Watch report states that some local officials have reacted to mass poisonings by arbitrarily limiting lead testing, withholding and possibly manipulating test results, denying proper treatment to children and adults and trying to silence parents and activists. There was panic in Mianyang in Sichuan last week when it was announced that manganese pollution in the water had "exceeded limits" on Thursday (July 28), according to Radio Free Asia and Chinese state media. Radio Free Asia quoted municipal official Kou Zisheng as telling reporters on Thursday: "At noon on July 26, following tests by the municipal environmental protection bureau, we discovered that the water at the Qilu bridge section of the Fu River contained levels of manganese over the legal limit. After examination of the water by water quality experts, it was determined that the reason for the unusual water quality results was that mining waste water from ... Songpan county had overflowed into the Wudu reservoir." The plant was named as the Xichuan Minjiang Electrolytic Manganese Plant in Songpan (Tibetan: Zungchu) county in Ngaba (Chinese: Aba) Tibetan and Qiang Autonomous Prefecture. Tibetans have increasingly been prepared to articulate their concerns about the impact of mining or other industrial activity on their local environment in recent years despite the dangers. On May 15, 2010, police opened fire on Tibetans at a cement factory in the Tibetan area of Amdo (Labrang, in Gansu province) after local villagers, worried about pollution from the factory, started to rebuild a road that had been closed by the expansion of the factory. Fifteen people were taken to hospital with gunshot wounds or injuries from beatings by police, although no one was killed, according to an exile Tibetan source in contact with Tibetans in the area. The Chinese authorities started surveying and mining Tibet in the 1950s. The mining industry expanded considerably during economic reforms of the 1980s and 1990s but generally remained small-scale. 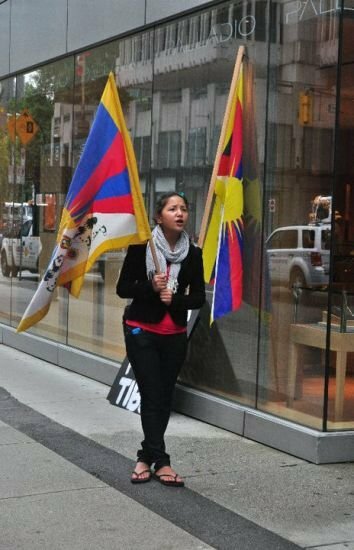 As China has faced growing shortages in the domestic supply of raw materials there has been an accelerated exploitation of Tibet’s minerals and as infrastructure has developed mineral commodities have become increasingly accessible. Poor governance and control over mining have in some cases exacerbated its environmental impact as the interests of local people have been subordinated to those of officials and the state. Mining has had a serious environmental impact in many areas, notably land degradation, pollution, and harm to livestock and wildlife bio-diversity.